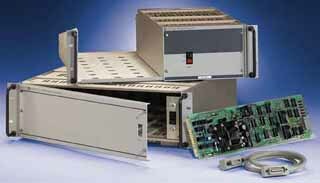 SNR are card cages that accommodate plug-in program cards: SN 488-B and/or SN 488-D.
Each program card controls one power supply and is isolated from the others in the card cage. The program cards provide two channel listen-only digital to analog conversion from the IEEE 488 bus in either BCD or Hex form for use by Kepco analog-controlled power supplies to set both voltage and current. SNR are CE Marked per the Low Voltage Directive (LVD), EN61010-1. SN 488-B plug-in program cards are for SNR 488-4, and SNR 488-8 in 12 bit binary format. SN 488-D plug-in program cards are for SNR 488-4 and SNR 488-8, in 3 digit BCD. These are standard cables with an IEEE-488 connector at both ends.